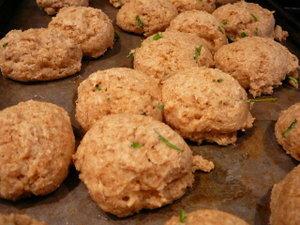 This is mostly the Joy of Cooking recipe for whole wheat biscuits with a bit of changing up to make it chive-worthy. Blend all ingredients except buttermilk in mixer until pebbly. Don't let it get to a solid mass. Add buttermilk and chives and mix. I used a cookie scoop to make mini-biscuits cooking them for 10 minutes at 400F degrees. I love my cookie scoop and it makes dishing things out so much easier. The biscuits come out looking like bite-sized puffs. i finally got a picture added. i love my cookie scoop. i use it for everything i can these days.